Our Daily Deal today features one of our most popular products. The unique shape of our bowling bag - with its long shoulder straps - makes it ideal for carrying workout gear, the essentials for an overnighter or pretty much anything you can think of! For today only we've reduced the price by 30%, and only while stocks last. Simply click below for more information and to purchase. 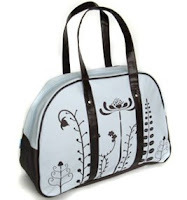 The perfect workout bag in a lovely blue/brown design. Fit everything you need for yoga or the gym into this striking retro-shaped bag with long over-the-shoulder handles. Perfect as a sturdy daytime carrier or for overnight travel. A stylish alternative to that tired gym bag or knapsack. Inner zippered pocket and outer end pocket help keep you organized. For more great deals during our winter sale, check out our sale shop at Lavish & Lime. And be sure to check back here again for tomorrow's Daily Deal.